A lot of car dealerships are family businesses, but that goes even further at Ride Time. The two MacIver brothers, or the Brothers of Bargains, head the company the way only brothers can – with plenty of bickering, yelling, and forgiveness. It actually works pretty well. But how – and why – did Andrew and Doug MacIver get into the car business? Doug MacIver Sr. was a hit in the Canadian auto scene. His knack for winning people over and a competitive nature from a successful football career made him a talented businessman. And the elder MacIver passed on that talent to his boys. “It’s embarrassing because it was very nice,” Doug MacIver Jr. says when asked about his first car. It was a 1978 Mercedes-Benz 450SL convertible, completely restored to mint condition. But since he sold cars, Andrew’s first car was a 1994 Dodge Stealth RT twin turbo. “It was my favorite car growing up,” he says. As a kid, he even bugged his dad to put one away for him when they first came out. He wasn’t aware at the time how much money that ties up. Luckily, one got traded in soon before Andew got his license. But along with the nice cars, Doug Sr. imparted plenty of wisdom onto his two sons. It was his guidance and example that set Ride Time up for success, but his sons found their way into the car business very differently. “I knew from a very early age what I wanted to do,” Andrew says. As he got older, he’d help answer phones. A few years later he was washing cars and serving as a jockey for vehicles. “I just always wanted to be in and around the business,” he says. He took it seriously, too, graduating from Georgian College with an auto marketing diploma before getting a dual major in automotive marketing management from Northwood University. That’s when his dad and he started Canada Wide Vehicle Finance, which grew from a small office into the Ride Time that stands today. Doug Jr. never saw himself heading for the dealership as a kid. But he did take after his father’s athletic ambition. He recalls one morning “when I was like 17 or 18 years old, and my dad was getting ready to leave for work on a Saturday.” Having made the most of the weekend, the younger Doug was planning to stay in bed long past 7:30. But Doug Sr. had other ideas. “My dad forced me to get out of bed and told me to start training, because there were kids in Europe that had already been training for 7 or 8 hours, and I was still sleeping,” he says. While his dad taught him the value of hard work, Doug Jr. took to a different sport than his father. Next, he played professionally for 9 years. But when a knee injury put him at a crossroads, he decided to head home. Doug had worked with the family business a small amount in the summer, but hadn’t done anything substantial. For him, the car business had been an option if he tired of hockey. When he returned, his dad and Andrew tried to put him on the salesfloor. “Coming back from sports, I found that I was probably too aggressive for sales,” he says. But their dad, as usual, had the answer. 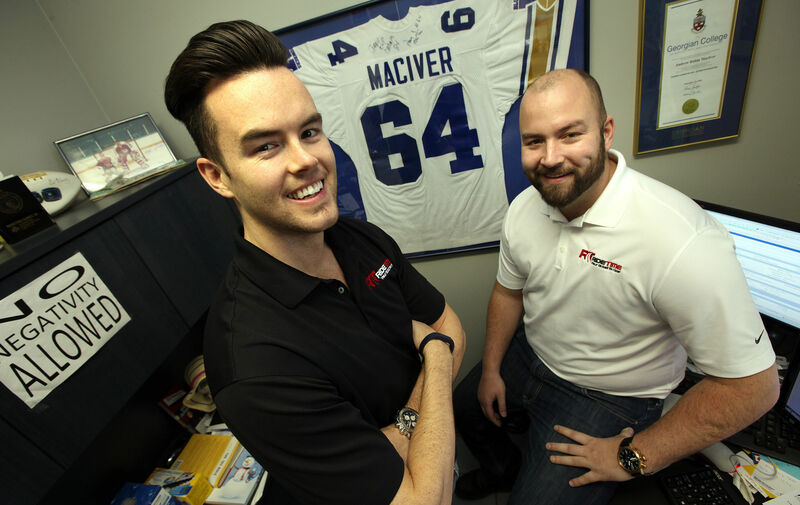 Andrew MacIver and Doug MacIver have worked hard to shape Ride Time into the ideal place to shop for cars in Winnipeg. They understand how the business is changing, and they’re working to do everything they can to meet the new expectations people will have down the road. “The future is going to be less face-to-face interaction in the dealership,” Andrew says, and the Brothers of Bargains are actively finding ways to make car buying easier for customers across the board. With each of the brothers focused on different parts of the business, Ride Time is able to craft the best experience for you.